Wikipedia founder Jimmy Wales thinks there is going to be an “enormous backlash” against Donald Trump’s lies. He said the US president is a “very talented man” and deserves credit, but the truth could eventually catch up with him come the 2020 election. Wales said his website WikiTribune is still finding its feet and is on the hunt for its breakthrough scoop. Wikipedia founder Jimmy Wales has some grudging respect for Donald Trump – but he thinks a backlash against the US president is coming. Wales, who has been named in Business Insider’s UK Tech 100, said he does not necessarily buy into the narrative that Trump is not very smart. He said the former star of “The Apprentice” deserves credit for his achievement in reaching the highest office in America and maintaining his core base of support. Trump has managed this, in part, because “he lies all the time and openly and cavalierly doesn’t care about the truth,” Wales said. But he thinks the truth will eventually catch-up with the president come the 2020 election. “I actually think there is going to be an enormous backlash. I remain optimistic. I don’t think that the public doesn’t really care about the truth,” said Wales, who set up journalism operation Wiki Tribune to debunk fake news. WikiTribune has an earnest approach to the truth. After launching in October last year, the website recently underwent a redesign and is populated by a team of 10 journalists, who work alongside a “community” of truthseekers. Wales’ mission is to find stories that other major news sites overlook and give them a platform. 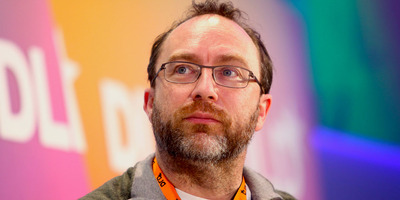 Wales admits WikiTribune is yet to have its breakthrough moment, but he says the news business is “intensely competitive” and he is comfortable with the progress the site has made to date. “Nothing has really set the world on fire in terms of a big breakthrough story that changed the world but we’re young and we’re very small,” he continued. Ultimately, Wales thinks that the truth still matters and WikiTribune will find a place because getting to the bottom of an issue and establishing fact from fiction requires the kind of work the site is doing.